To clarify the anatomical distribution of otosclerotic loci in otosclerosis. Ninety-five patients with surgically confirmed uni- or bilateral otosclerosis were enrolled into the study. Hypodense areas observed in the otic capsule by high-resolution computed tomography (HRCT) were defined as otosclerotic loci. The location and number of lesions were examined, and the probability of lesion overlap and correlation with age/hearing parameters (air and bone conduction threshold, air-bone gaps) were tested. 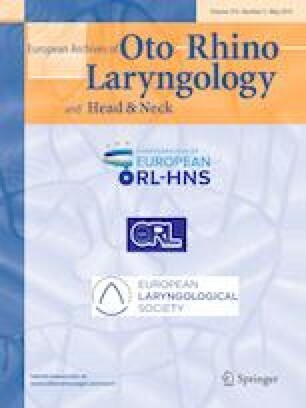 Otosclerotic loci were confirmed by HRCT in 77 out of 115 operated ears. The three commonly affected sites were the anterior part of the oval window (ant-OW), anterior part of the internal auditory canal (ant-IAC), and pericochlear area (PCochA), with lesions detected in 96.1%, 46.8%, and 26.0% of ears, respectively. Only the ant-OW area was affected in 48.1% of the ears; the ant-IAC in 3.9%; and PCochA in none with significant differences (p < 0.01). The ant-OW lesions preferentially overlapped with ant-IAC (44.6%) than PCochA lesions (27.0%) (p < 0.05). Among double sites diseases, triple sites diseases occurred more commonly in the ant-OW + PCochA group (80%) than ant-OW + ant-IAC group (48.5%) (p < 0.05). There was no correlation between a number of lesions and age/hearing parameters. Based on the probability of lesion overlap, otosclerotic lesions may initiate at ant-OW followed by ant-IAC and later PCochA. Although the number of lesions showed no immediate correlation with hearing level or age, anatomical stage of the disease estimated by the location and the number of otosclerotic loci could be useful in predicting the future hearing status. This study was approved by the IRB of Niigata University Medical and Dental Hospital (#2017-0271). All procedures performed in studies involving human participants were in accordance with the ethical standards of the institutional and/or national research committee and with the 1964 Helsinki declaration and its later amendments or comparable ethical standards.